What is more fun than some matching shirts? 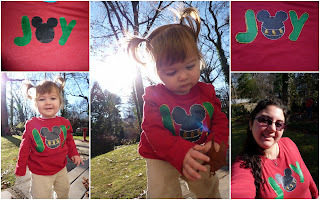 How about some matching Disney and Christmas-themed shirts? For our annual family picture this year, I wanted to make some shirts for us to wear. I used freezer paper, cut out my design, and ironed it to the shirt before painting in the lines. I should have let the paint dry longer before pulling off the freezer paper because I ended up having to outline the design because some of the paint pulled off. I know for next time. I am very happy with how the shirts turned out. The total project was about $25 for everything. I could have done it cheaper, but it was a last minute idea so I didn't have time to utilize the Salvation Army. Kaelyn is a great model.